Education toward further professional development has a selective and elite character, because precondition for qualifying is here student’s musicality (good musical hearing) and the sense of rhythm. On this level teaching is concentrated specifically on developing student’s basic abilities for her/his future artistic performances, and then, gradually, introducing young musicians into the world of more complicated ‘real’ music. Here the teaching is based on the very rich musical tradition accomplished in the last decades by our outstanding musicians and pedagogues. Musical tradition makes for us the foundation on which we build and develop our new methods in instrumental teaching. We pay also attention to make the educational process both professional and attractive to the students. The general musical sensitivity does not require especially great efforts in playing instrument at home. In fact, it is a kind of a joyful musical adventure. Unisono Music Academy invites to and offers instrumental musical education and education in solo vocal singing both for children and adult enthusiasts of music, who by exercising good music want to free themselves from the turmoil and hectic of their daily life and submerge into the harmonious world of beautiful sounds. Our great composer, Fryderyk Chopin once said that there where words come to their limits begins music. Researches made by American sociologists and psychologists confirmed the thesis that intensive instrumental playing has beneficial influence on children’s psychological development. These researches proved beyond any doubt that adults who in their childhood practiced music, have greater capacity of concentration and are more resistant against stress. They also are better capable of defining their goals and show greater consistency in their strivings. It doesn’t matter so much what instrument you play – be it guitar, violin, piano or flute – what really matters is the playing itself which develops the capacity of our brain. Scientists from the Northwestern University (USA) analyzed the influence of musical training on human speech, capacity of memory, attention and expression of emotions. Results of their findings can be found in “Nature Reviews Neuroscience” magazine. Their analyzes clearly show that connections between neurons which occur during musical training make our brain more effective. Our brain cannot put together and analyze all stimuli which overflow it at the same time – so it must select them and choose only those which are the most important, says Nina Kraus who led this project at the Auditory Neuroscience Laboratory at Northwestern University. see: Nina Kraus and Bharath Chandrasekaran, “Nature Review Neuroscience” 11, 599-605 (August 2010). “The effects of music training in relation to brain plasticity have caused excitement, evident from the popularity of books on this topic among scientists and the general public. Neuroscience research has shown that music training leads to changes throughout the auditory system that prime musicians for listening challenges beyond music processing. This effect of music training suggests that, akin to physical exercise and its impact on body fitness, music is a resource that tones the brain for auditory fitness. Therefore, the role of music in shaping individual development deserves consideration”. Playing musical instrument is a perfect training for our brain cells because musicians must read and remember musical notes and at the same time play correctly the melody, keep the right rhythm and coordinate their playing with other performers. This makes them more apt to identify and select informations from the surrounding background better than persons who have no such experience. It shows, that this ability also influences other cognitive functions, like learning, and especially learning languages, memory and neuro-plasticity in many brain areas. 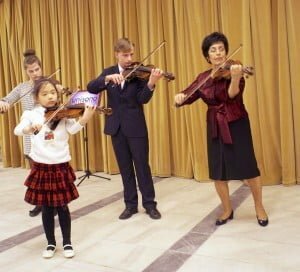 Our music school in Warsaw is jointly created by its teachers and students – by their efforts, achievements and joy of common passion for music.